Megaload opponents and tax activists forced Lewiston port officials Wednesday to disclose how they expect to find customers for their recently expanded container dock. Information, however, was the only concession offered at a lengthy, sometimes testy hearing. It ended with port commissioners passing a $1.9 million budget for the 2015 fiscal year without changing anything, including a $450,000 annual property tax levy for Nez Perce County residents. Among the more than 15 people who attended the morning meeting was Linwood Laughy, a Kooskia-area resident and leader of megaload opponents. He met Port Manager David Doeringsfeld for the first time. Carla Timentwa, chairwoman of the Nez Perce Tribe’s General Council, identified herself as one of the people arrested last year during megaload protests. Bakken Oil Field Equipment on Idaho Roads? …In other business, Lewiston Port Commissioners on Wednesday also discussed another possibility for hauling machinery or supplies to the Bakken oil fields in North Dakota. The port has already received an inquiry from a business that wants to barge supplies up the Columbia and Snake rivers and load them onto trucks at Lewiston for the last leg of the journey, Port Manager David Doeringsfeld said. The port’s staff is drafting an ad to appear in North Dakota newspapers that would promote how the Port of Lewiston is less than 900 miles from the oil fields, Doeringsfeld said. Haulers who want to send regular and oversized shipments through the port could be among the new customers the port generates through the promotion, Doeringsfeld said. Governor C.L. (Butch) Otter tells whoppers. In March 2011, he told a congressional committee that more folks visit the Coeur d’Alene golf course floating green than the Frank Church Wilderness. Was he unaware that more than 35,000 visitors recreated in the Frank in 2010? A year earlier, contrary to 50 years of Federal Highway Administration research, Otter repeatedly claimed that a megaload weighing 600,000 pounds with multiple axle weights exceeding 35,000 pounds would cause no more highway damage than a one-ton pickup. Welcome, Mr. Secretary. Why’d You Come? Aside from former Idaho governors who wind up in a presidential administration – Interior Secretaries Cecil D. Andrus or Dirk Kempthorne – Lewiston doesn’t often see a cabinet member stop by. So Transportation Secretary Ray LaHood’s visit Wednesday to the Port of Lewiston was a big deal. The former seven-term House member runs an agency that employs 55,000 people and spends $70 billion. Thanks, Mr. Secretary, for coming to see us – or at least a selected group of 50 dignitaries and reporters you invited to attend – Wednesday. Just one question: Why did you come? No, really. Supposedly, the visit was timed to highlight a $1.3 million Transportation Investment Generating Economic Recovery Discretionary Grant allowing the port to expand its container dock. A group of protesters crowded the entrance to the Port of Lewiston Wednesday, chanting and holding up signs in outrage regarding a recent port grant. Protesters said their anger is directed toward the federal government, who granted the port $1.3 million for the inland port improvement on the Columbia/Snake River System. Protestors said spending millions of taxpayer dollars for a port that’s not producing jobs or enough shipments is a substantial waste of money. Protesters also showed their disapproval of the grant, voicing their concerns about more megaload traffic and the negative impact it inflicts on the environment. The activists also provided onlookers with informational sheets explaining why they believe the Port of Lewiston extension is a bad idea. 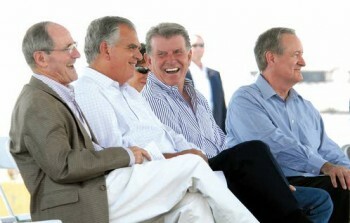 Idaho Senator James Risch, U.S. Transportation Secretary Ray LaHood, Idaho Governor C.L. (Butch) Otter, and Idaho Senator Mike Crapo were at the Port of Lewiston Wednesday to promote the expansion of cargo traffic through the port (The Lewiston Tribune/Barry Kough photo). 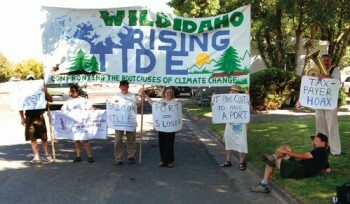 A group called Wild Idaho Rising Tide protested Wednesday during a visit by U.S. Transportation Secretary Ray LaHood at the Port of Lewiston (The Lewiston Tribune/Barry Kough photo). The area’s elected officials got a rare chance Wednesday to thank a Cabinet official on their home turf for the $1.3 million his agency gave to an expansion of the Port of Lewiston’s container dock. U.S. Transportation Secretary Ray LaHood toured the dock that stands in the Lewiston-Clarkston Valley, one of the few U.S. communities of about 50,000 that’s more than an hour away from a multi-lane interstate highway. LaHood answered media questions and heard praise of the grant from Idaho’s governor, senators, and the port president.